Aerosols available to buy today at Rawlins Paints include spray paints for line marking, anti-climb sprays for property security, repair sprays to fix leaks in guttering, decorative finish sprays for aesthetic values on a range of surfaces, including glass, and restoration and refurbishment sprays for worktops, ceramic tiles and more. 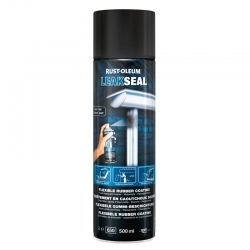 The widest selection come from Rust-Oleum, with their ever-popular Hard Hat Topcoats, LeakSeal, NeverWet and the CombiColor range. These products are designed for commercial and industrial use, although some are applicable for personal maintenance and decorating projects – touch-up tasks, re-colouring and covering rust. Always use these spray paints and aerosol coatings in well ventilated areas, and wear appropriate face masks and gloves, too. Refer to each products data sheets for full details on safety requirements. 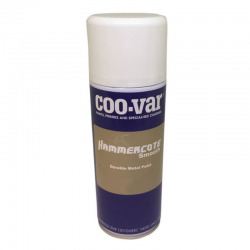 Aerosol primers, topcoats and technical sprays available in this category allow users to obtain a high-end, professional finish. 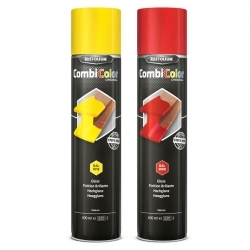 They often complement normal paints and coatings from the same manufacturer – for example, CombiColor spray paints would be a handy alternative to apply to difficult to reach areas, when other brush/roller applied products in the CombiColor range might not be feasible. Rust-Oleum Line Marking Paint Aerosols are designed for use together with the Rust-Oleum Line Marking Applicators. Rust-Oleum Line Marking Paint is ideal for drawing lines in parking areas, warehouses, sports fields, stadiums and all sites where traffic control is required. 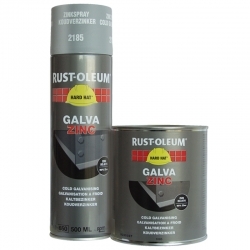 To be used on new, bare or slightly rusted steel surfaces to prevent further rusting and corrosion. 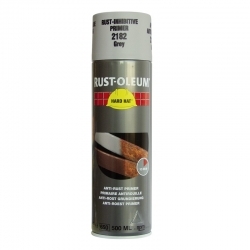 Rust-Oleum Hard Hat Anti-Rust/Anti-Corrosion Primers are for industrial exposure and should be over coated if necessary with the Rust-Oleum Hard Hat Topcoats range. Rust-Oleum Universal All Surface Paint is the world’s first all-surface spray paint. Its ergonomic comfort grip houses a unique trigger mechanism which delivers an advanced spray system that can dispense paint at any angle – even upside down! 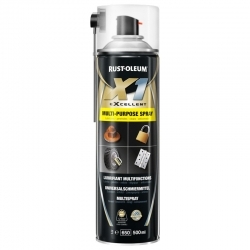 A general purpose lubrication fluid developed by Rust-Oleum that protects and cleans metal and plastic parts. 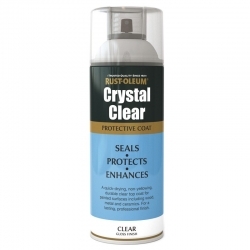 This excellent penetrating fluid has anti-corrosive and water repellent properties. It leaves a protective film layer after use. Aerosols are ideal for touch-up projects where something has been painted off-site and then during installation on-site things are damaged and need re-touching. Other times, the items are only small that require painting and don't require a large amount of paint, and aerosols can be a way to get a fantastic finish. If a special effect or unique finish is required, check out Rust-Oleum’s decorative finishes, including Crystal Clear or Rust-Oleum Metallic. Spray paints are the go-to method for temporary markings on building sites, sports pitches, and road/path or concrete repair areas. Delivering high-visibility and durable markings for access routes underground, or in low visibility areas on-site, Rust-Oleum’s Hard Hat product range is unbeatable.